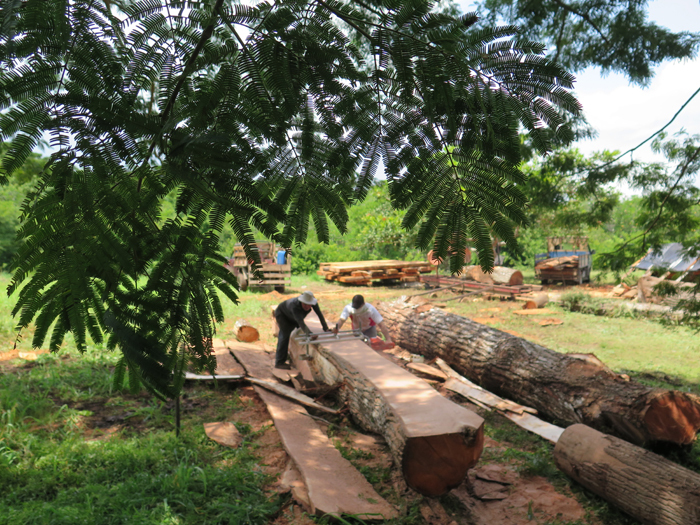 The Sail Cargo team mills up Spanish cedar for the Ceiba's build at their Costa Rica shipyard. A carbon-neutral cargo ship project based in Costa Rica is getting a little help from Salt Spring Island. Steve Abbott, a local investor in the project, will be sending a crate filled with donated hand tools, a bandsaw mill and a giant ship saw to the site on the Pacific coast of Costa Rica. The mill and ship saw were both procured in the Gulf Islands, and Abbott is looking for any donations of usable wood and metalworking tools to send along. The ship, named Ceiba, will be built entirely using green practices. It is being constructed by Sail Cargo Inc. as the flagship for a line of carbon-neutral marine freight ships based in Central America. The timbers will be sourced from properly permitted logging — which is much more stringent in Costa Rica — and trees will be replanted as they are cut. The team also hopes to use as much windfall as possible, and will only use non-endangered tree species for the construction. When finished, it will be 45 metres long with three large masts. The ship will resemble a traditional sailing ship, but it will also have modern additions to make travelling easier and more environmentally friendly. “This is essentially a conventional tall ship with the modern conveniences added,” he said. Those interested in donating tools for the ship are asked to phone Abbott at 250-931-7189. In addition to tools, they are looking for volunteers to help with construction and logistics of the project. Sail Cargo is also selling shares of the ship, which are available through their sailcargo.org website. For more on this story, see the June 20, 2018 issue of the Gulf Islands Driftwood newspaper, or subscribe online.